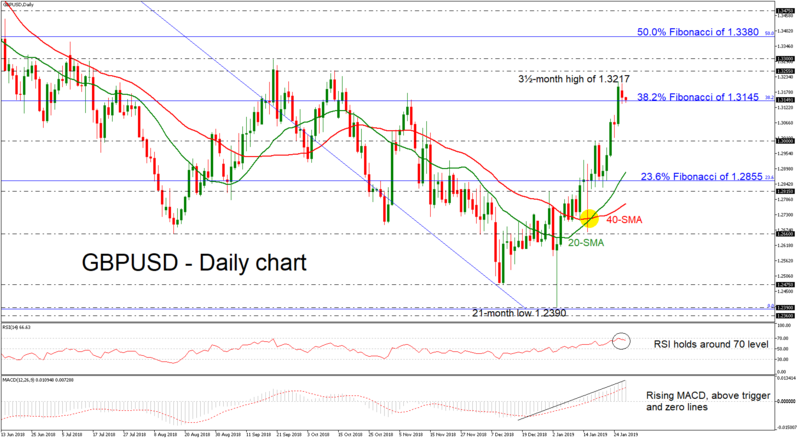 GBPUSD had been in a flying mode on Friday, reaching a fresh three-and-a-half month high around 1.3217, before slipping lower again on Monday towards the immediate support of the 38.2% Fibonacci retracement level of the downleg from 1.4375 to 1.2390, near 1.3145. Despite the latest setback, the pair holds above that area, signaling more gains. The RSI turned lower after entering overbought territory above 70. At the moment, it continues to flatten around 70 in support of a positive short-term picture. The bias in the very-short-term also looks bullish as indicated by the MACD, which is strengthening its upward momentum above the trigger and zero lines. If the price edges lower for the next sessions, creating a bearish correction in the near term, then the next barrier is coming from the 1.3000 strong psychological level. Further declines may meet support around the 20-day simple moving average (SMA) currently at 1.2880 before challenging the 23.6% Fibonacci mark of 1.2855. On the upside, resistance could occur near the 1.3255 – 1.3300 zone, taken from the highs on October 12 and September 20. Higher still, the 50.0% Fibonacci region of 1.3380 would increasingly come into scope. The short-term picture looks predominantly bullish, with trading activity taking place above both the 20- and 40-SMAs. However, in the medium-term cable is shifting the outlook to a more neutral one after the latest advance. A climb above the 50.0% Fibonacci would endorse the bullish structure in the longer-timeframe as well.